Even the most erudite among us use words like apocryphal, facetious, ironic, meteorite, moot, redundant, and unique incorrectly every day. Don’t be one of them. Using examples of misuse from leading newspapers, prominent public figures and famous writers among others, language gurus Ross Petras and Kathryn Petras explain how to avoid these perilous pitfalls in the English language. 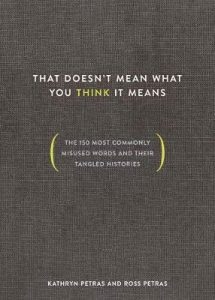 Each entry also includes short histories of how and why these mistake have happened, some of the (often surprisingly nasty) debates about which uses are (and are not) mistakes, and finally, how to use these words correctly … or why to not use them at all. By the end of this book, every literati will be able to confidently, casually, and correctly toss in an “a priori” or a “limns” without hesitation.